This stair profile is available in a pattern and surface structure that perfectly match your floor. To be installed in combination with the appropriate aluminium sub-profile. (To be ordered separately). Applicable to many staircases.No annoying demolition work.Facelift your stairs in a day! The combination of a strong aluminium sub-profile, Quick▯Step® One4All Glue, screws and the Quick▯Step® Incizo® profile composed of quality materials, results in a solid stair solution you can rely upon.Scratch-resistant surface.There’s an incizo® profile for each Quick▯Step® floor, with a perfectly matching colour. The result is a discrete and seamless transition to your floor.Straight or turning.With or without stair nose.Flush or non flush installation. OPEN STAIRCASES You can use the Incizo® profile to obtain a perfect finish for half-open stairs.Incizo® can be used at the side of the planks with a tongue.Alternatively, use the Quick▯Step® self-adhesive laminates to finish both sides of the stairs. (Only for laminate floors.Visit the Quick▯Step® website to find more detailed installation instructions. Ask your dealer for advice on the correct aluminium sub-profile for the Quick▯Step® floor of your choice. (sub-profile to be ordered separately)  Watch the new Incizo® 5in1 installation video.  Find more detailed installation instructions for stair finishing with Incizo®. Michael Bitto - t/a BargainFlooring- is installer & wooden floor supplier of all types of solid , semi-solid or laminateflooring . This focus allows me to provide an unrivalled service to customers. BargainFlooring also specialise on installation of laminate flooring on stairs = stair renovation . I can transform any old, outdated and worn staircase into a new, beautiful and elegant staircase that makes an impression to all who use it. 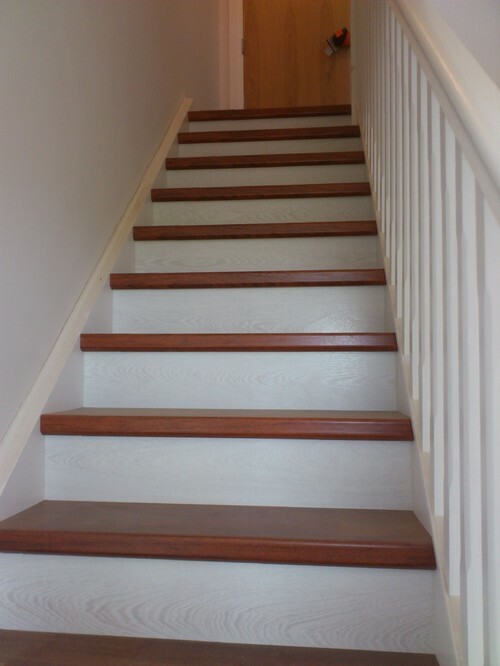 YOUR STAIRS OR STEPS ALSO DESERVE A PERFECT FINISH , Do you want to finish a new staircase or renovate an existing flight of stairs? Quick•Step® has the perfect easy solution. Cover your stairs with Quick•Step® planks and finish in the style of your choice with the unique Incizo® profile. renovate an existing flight of stairs with Quick•Step®. dust. And your stairs will match the rest of your home to perfection. o READ AND FOLLOW THE SAFETY INSTRUCTIONS INCLUDED WITH POWER TOOLS USED. o SAFETY GLASSES SHOULD BE WORN AT ALL TIMES. o Only for use in residential applications . - Double-check you have ordered the correct aluminium subprofile for the Quick•Step® floor of your choice. - Clear the stairs of debris, making sure that all stairs are clean and level. - Use screws of 2,5 mm diameter. Drill diameter should be 3 mm. - Decide which stairs you want to obtain using the table, then concentrate on that type of finish, following the key as indicated in the table. 1.Start at the top of the stairs and work downwards. 2. Prepare 2 spacers per stair tread. Important: the spacers should have a thickness of the Quick•Step® floor you use, plus 2 mm. This will enable you later to easily insert the tread plank under the stair riser plank. 4A-4B. Saw a plank to the right size. If needed, click 2 planks together and only saw the tongue of the upper plank. *For type H, saw the tread plank like this. 5. Apply glue to the plank. 6. Put the plank against the riser. The groove should be behind the spacers. Repeat 1-6 for the rest of the stairs. 8. Saw the aluminium subprofile to the right length. 9. Apply glue to the bottom of the subprofile. 10A-10B-10C-10D. Install the subprofile on the tread. Screw it to the stairs, with an interval of 15 cm. Make sure the screws are well countersunk. 11A-11B. Saw a plank to the right size. If needed, click 2 planks together and only saw the groove of the last plank. *For type H, saw the riser plank like this. 12. Saw the Incizo® profile to the right length. 13. Cut the plastic insert to the right length (plastic insert is included in the aluminium subprofile packaging). Apply glue to the tongue of the plank. 15. Apply glue to the subprofile and the rest of the tread. Apply in rows of +/- 3 mm. 16. Spread the glue out well on the subprofile (e.g. by means of a brush). adjustable when installing the Incizo® profile. flat. * For type H, install the riser plank like this. 18. Apply glue on both sides of the Incizo® foot. 19A-19B-19C-19D. Stick the Incizo® profile onto the subprofile and adjust the Incizo® and the plank nicely for a level result. Repeat installation for the rest of the stairs. After installation, do not walk on the stairs for at least 24 hours. 20. Cut off part A of the Incizo® with the Incizo® knife -- see instructions included in Incizo® packaging. Half-open stairs can be finished with Incizo®, on the side of the plank with the tongue. Miter both the Incizo® and the aluminium subprofile and install as explained above.